Stained glass restoration is required for any antique stained glass piece typically when it enters the 75-year to 100-year mark. Restoration can extend your religious stained glass’ lifespan for another century before requiring another proper restoration. Restoration offers preservation of the significant antique value of your stained glass while ensuring your church’s property value remains heightened as well. Religious stained glass restoration also guarantees that future generations of your congregation will also be able to appreciate and treasure these items individual to your house of worship. Ensuring these inspiring religious stained glass pieces remain in good condition can really enhance the worshiping experience, attracting new, potential members for your congregation. 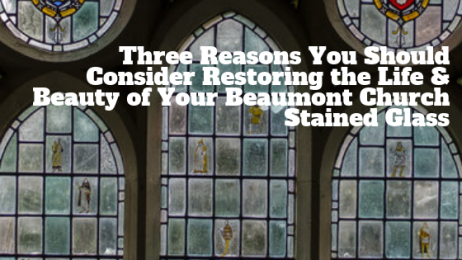 With countless benefits tied to restoration, Beaumont churches can rest assured knowing their stained glass pieces can last multiple lifetimes. Houston Stained Glass prides ourselves on our renowned religious stained glass restoration process. Our comprehensive restoration service begins with a thorough assessment of your stained glass in order to provide specifics regarding project duration and expenses. Once restoration begins, we transport your stained glass windows back to our repair studio where our stained glass artisans meticulously restore each individual piece in addition to creating new lead came for renewed structural integrity.